On April 4, 2010, Easter Sunday morning, Rev. Tony Ponticello addressed the congregation at the Community Miracles Center in San Francisco, California. What follows is a lightly edited transcription of that lecture. I think it’s always a challenge to demirr a sermon on Easter Sunday, because Easter is generally considered, especially in traditional Christianity, the highest of holy days. This always confused me when I was a kid because, to me, it was obvious Christmas was much higher than Easter. There was much more hoopla over Christmas. Why they said it was Easter didn’t make sense. I used to get an Easter basket though, from the Easter bunny, and there were all kinds of chocolates and candies in it on Easter morning. Chocolate and Easter always went together. So, I do have fond memories of Easter. My mother used to do an Easter egg hunt. She would color the eggs, my two sisters and I might help in that process. Then my mother would hide the eggs all over the house. On Easter Sunday morning my sisters and I would get up and try to find all the eggs which we would have to do before going to church. My mother would always hide most of them in the same places every year, but after a couple of years she would try to find new places, but there were only so many places she could hide those eggs. In A Course In Miracle’s terms I think Easter is really about just having a choice. It’s “Happy Easter.” It’s that chance to choose happiness and to choose happiness regardless of the circumstances that may be going on in our lives. Whatever is going on in our lives, that choice for happiness is always there. We can always make it and I think that’s about as basic of a lesson from A Course In Miracles that we can possibility have. Just make that choice for happiness. Let the circumstances be whatever they are. We can still make that choice because that choice has to do with something internal. It dose not have anything to do with anything external. Traditional Christianity, of course, links Jesus’ resurrection to what were celebrating on Easter. The crucifixion, so I was told, was celebrated on Good Friday, which was a huge anomaly because it never seemed that good. We went to the stations of the cross every Friday during Lent, and it was all about Jesus’ suffering and dying I could never figure out how that was good. However, it was good in traditional Christian terms because somehow, through his sacrifice and his death, he became the altar lamb that had to be sacrificed. The lamb of God, the son of God, had to be butchered on the altar so to speak. That was the last sacrifice of blood that was going to be required in the world, because God had sent his only Son down here, by his sacrifice, his death, and through the bleeding of his Son, somehow we would all be redeemed. There would be no need now for any more blood sacrifices after this crucifixion event. I remember that lesson getting drummed in to me time and time again. I even remember hearing that drops of Jesus’ blood had to hit the earth. That was something about the atonement too. Somehow Jesus’ blood had to hit the earth, and mingle with the earth, and that way the earth would be healed. How could man be capable of thinking that suffering could accomplish anything when Jesus’ main teaching, if you go through the Bible, the main thing Jesus said was “Fear not” or “Be not afraid.” Don’t suffer so much. If that was the main teaching that God, through Jesus, was giving us how could it be that this same God would want his Son to suffer and to die that horrible death on the cross. Thinking something good can be brought about by suffering is one of those ideas that we ACIM students really have to purge our minds of. We have to really get to fear not, be not be afraid, to not suffer and to not give into that idea that somehow suffering buys us something. The word Easter actually appears in A Course In Miracles twelve times. It does appear more that the word Christmas. I guess Easter is more important than Christmas. I am going to read just the times “Easter” appears in the Text. In one place it says, “It is almost Easter, the time of resurrection.” (Tx.Or.Ed.19.26) We have to focus on resurrection. We have to focus on overcoming. 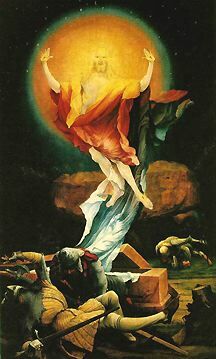 I always try to take a broader view of resurrection, not just the resurrection that we know about from the myth of Jesus, but a brooder view of resurrection, overcoming, rising above something problematic that is in our lives. In another place it says “For Easter is the sign of peace, not pain. A slain Christ has no meaning. But a risen Christ becomes the symbol of the Son of God’s forgiveness on himself; the sign he looks upon himself as healed and whole.” (Tx.Or.Ed.20.1) I liked this one because it introduces the idea that Easter is really about forgiveness. The resurrection is a sign, or a symbol, that is based on forgiveness. That’s how we overcome the world. That’s how we resurrect anything that seems to be a problem in our lives. We forgive it. We give it up to the Holy Spirit. We let go of our negative perception. We let go of our judgment of it. We offer it up; we forgive it. That is what Easter is really about. It’s about having that resurrection about all the crucifixions we have in our lives. A Course In Miracles says this in another place, “This Easter, I would have the gift of your forgiveness offered by you to me and returned by me to you.” (Tx.Or.Ed.20.2) Here is another one of those places in the Course I could give a whole sermon on. I think I have at times. This is Jesus actually asking for our forgiveness. We have to forgive our image of Jesus. Now that’s always a little confusing. What did Jesus do? He was our savor. Why would we have to forgive him? There are reasons for this. Take the Course’s thought system, process it as a whole. The image of Jesus suffering on the cross that we have embraced for so long, and what it all meant, is what we have to forgive. We have to offer that all up. We have offer up this idea that anything in the world has to suffer because of our sins. We have to forgive that role that many people thought Jesus had to play. If we forgive our brothers and sisters then we rise them above the judgments and the grievances that we used to have of them. They become our risen friends. Those who we would judge, or hold grievances against, have not been resurrected. It is not their responsibility to resurrect themselves. It is our responsibility to resurrect them by forgiving those perceptions that we have of them and then look upon them as risen. Realize in truth, they are our friends. They are our sisters; they are our brothers. They are one with us. A Course In Miracles says, “This Easter look with different eyes upon each other. You have forgiven me. And yet I cannot use your gift of lilies while you see them not.” (Tx.Or.Ed.20.10) Again, we have to look with different eyes. We have to look with those eyes that don’t see grievances and fear. That’s how we forgive and that’s how we give the gift of lilies. There are some wonderful lilies right here that were a gift to the Community Miracles Center. (A wonderful, abundantly bloomed pot of lilies is in front of the podium.) That’s how we give the gift of lilies. We look with different eyes. We look with forgiving eyes. Here’s another quotation, “The song of Easter is the glad refrain the Son of God was never crucified. Let us lift up our eyes together, not in fear, but faith.” (Tx.Or.Ed.20.12) Easter should always be happy – happy because the crucifixion had, in fact, never truly happened. We lift our eyes together, and we do that not in any kind of fear, but because we have faith the same resurrection that is so symbolically demonstrated by the myth of Jesus we can have in our own lives around every little crucifixion that we seem to have. This is my last Easter quotation, “This is the way to Heaven and to the peace of Easter, in which we join in glad awareness that the Son of God is risen from the past and has awakened to the present.” (Tx.Or.Ed.20.14) We release any grievance that we have against somebody because of something we think that happen in the past. A Course In Miracles has us truly challenge ourselves and do something. Just about every spiritual discipline says to focus on the present, let go of the past. Whatever grievances we have are focused on the past. Let’s focus on the present. The son of God, our brothers and sisters, have risen from the past and we have awakened them. We have awakened our perception of them. Then we too awaken in the present. In the present moment we are always guiltless. We see our brothers and sisters as guiltless. We see ourselves as guiltless. Many of you know what I’m going to speak of next because you’ve heard me speak of this often. I don’t know what to make of the Biblical story of Jesus. It can’t be proven. I think it’s a very interesting story. I think it can be used as a healing metaphor. I always relate to it as a myth because that’s the best I can do with. It’s a very interesting, beautiful myth, but I have no proof the Biblical story actually happening, and it’s not going to save me. What’s going to save me is Jesus, or the Holy Spirit, somehow being real for me now. I have to make the resurrections real for me in the present. I can’t rely on this mythological resurrection that maybe happened two thousand plus years ago. I know that there are widely divergent views on all of this. We have an on-line discussion group that takes place on our web site. Those of you who are Supporting Members know, because you get the posts via email. It has been very active lately. Everybody has been posting, especially around this idea. Is A Course In Miracles telling us to truly physically heal the body or not? There are a lot of different perceptions about this and a lot of interesting ideas on both sides. I have listened to things on both sides of this debate for as many years as I have been studying the Course. This is a very common debate. There have been times when I have been rather militantly in favor of the idea that ACIM is training us to heal the physical body. Over the years, I have mellowed a bit. I am still basically in favor of that line of thought, but I don’t want to exclude people who have other ideas about the Course. In truth, I feel that we should all be very open to all people who study A Course In Miracles. I have always tried to do this, and Rev. Larry has tried, and I think all of our ministers have tried. When our ministers get up here to speak, they don’t have to review for myself or Rev. Larry what they’re going to say. They don’t have to get our okay about what they’re going to teach. They teach whatever they think that they are guided to teach, what they feel the Holy Spirit is guiding them to teach. It can differ very much from the interruptions that I have expressed, or that Rev. Larry has expressed, because we feel that all interruptions should all be open for discussion. Deal with the resurrection; deal with the crucifixion. Treat it as a real happening; treat it as a myth. Deal with physical healing. Think that is what A Course In Miracles is teaching us to accomplish. Think that ACIM is not teaching us about physical healing at all. I think the thing that matters more is that we read this book, study these lessons and do our best to truly forgive our brothers and sisters. That’s much more important than the other stuff. Can we forgive our brothers and sisters? Can we forgive the President? Can I forgive the Republicans who are trying so hard to block this thing called health care reform? I guess it did not work, but they’re still trying. Can I forgive them? Can I forgive Islamic fundamentalists, terrorists who do all of these terrible things to harm people and to kill people? Can I forgive them? Can I really forgive the world? Can I offer those perceptions up and choose a new perception that the Holy spirit will give me because that’s the only way I am going to be happy? That’s the only way I am going to have a happy Easter. What do I perceive now about physical healing? I still do think that is what A Course In Miracles is leading us to, but I think very, very few of us are at the level where we can truly embrace that and bring that into our mirs. Now ACIM also teaches us that we only see people the way we see ourselves. This means that I don’t think that I am at the level where I can truly heal my physical body and thus have the kind of physical resurrection that is in the myth of Jesus. I believe that when I lay my body down, in whatever form I do that it is probably “bye, bye” for me and this world. I don’t expect to resurrect. I get my illnesses and sometimes I am able to heal them easily and sometimes not. I’ve had a sore shoulder for a couple mouths now. It still hurts. I have offered it up to the Holy Spirit. I am still in pain, I guess I have to accept this too. I think that is much more at the heart of the matter than whether or not A Course In Miracles is about healing a physical body or having a physical resurrection. We all have personal crucifixions everyday. We all have personal resurrections everyday. Nobody knows how difficult it is for us to rise above things in our lives that seem to trouble us. I have been crucifying myself many months now because I was so far behind and because of the work load here and other things. I was far behind in my own personal finances too. I have to log in everything very carefully because I am self employed. I was so far behind that I never thought I could ever finish my taxes on time. It bothered me. I thought I was going to have to file an extension. I didn’t know where I stood financially. I didn’t know if I owed money to the IRS or if I didn’t. I actually thought I owed several thousands of dollars, but this past week I was able to do my taxes. I was sitting with Rev. Larry a number of times while he was ill recently. I was able to work on my finances while I was there with him and I got all of my work caught up and my taxes done. I actually found out that I was going to get money back. I was shocked. Actually that was my personal resurrection. I was crucifying myself over not doing my finances and having my taxes to do. I was telling myself that my life was out of control. I felt guilty because my life was out of control, because I didn’t have my finances in order. Well I had a little resurrection around that. Everything is in order now. My taxes are now in order. I electronically transmitted them to both government agencies. Its great now. You can file electronically and then both the IRS and the California State government tell you within a hour or two whether they have accepted your taxes or not. It’s really amazing. I heard within a couple of hours that both government agencies had accepted my taxes. That great. That’s my little resurrection story. That happened for me this week. It’s as real for me as other resurrections stories that other people have. We can rise above whatever it is going on in our lives and move towards an awareness of truth. We can get all of the help that we need to handle whatever it is that we need to do. Maybe some of you think the idea of taxes is not much of a resurrection idea. Well maybe it’s not for you, but it was a big deal for me You all have your own resurrection stories. You all have your own crucifixion stories and we’re not here to judge anybody else. We’re not here to judge whether people can, or can not, heal their physical bodies. We’re not here to judge whether people can, or can not, heal their relationships or heal their financial situations. We have to look at are own lives and see how we can rise above. We have to see how we can get through that feeling that we’re not at peace. We have to see how we can get to the idea that we are being truly forgiving and not judging other people. It is so important, especially for us who have tempers. I have a temper. I was raised in a household where yelling was okay. It happened almost everyday. That was how we related. I was actually taught that the person you were yelling at did not think that you didn’t like them. You doing that was just how you related. In the moment, you were probably angry. You always knew that moment would pass, and you knew that you still loved each other. That’s just the way it was. This way of relating has not worked that well for me as an adult. I am really glad that A Course In Miracles has helped me with that. One of the quotes from ACIM that has helped me with getting mad and angry is, “Teach no one that he is what you would not want to be. Your brother is the mirror in which you will see the image of yourself as long as perception lasts. And perception will last until the Sonship knows itself as whole.” (Tx.Or.Ed.7.73) In every argument that I ever had, I have been trying to teach somebody that they are some way that is not good. They are bad in some way, shape, or form. I never realized this until I got involved with ACIM. What I was doing was just reinforcing that same characteristic in me. Now that I know that, maybe eighty percent of the time, it stops me. The other twenty percent of the time I still listen to my ego. It is also true, when I feel something coming at me, sometimes when people are arguing with me, I am able to understand it’s really not about me. If I send love and peace to that person doing this, maybe we can get a shift in perception. What they are truly doing is reinforcing these traits in themselves and trying to project these traits onto me. It helps me to be aware of what actually is the power dynamic that is going on when we are in those moments. For me, that is a tremendous resurrection over a crucifixion that has plagued me in my whole personal life. My family, back in upstate New York, still basically has that urge to yell at each other. That’s why I frequently have difficulty when I go home, because I slip right back into it. Those behaviors are really hard to let go of, but through disciplines like A Course In Miracles, and other teachings of this nature, we can stop those kind of things. We can at least make progress in letting go of those kind of things. We can forgive, not in a worldly sense but in a truly spiritual sense, where we see that what we were holding on to never actually happened. That’s how we will be happy and that’s how we will resurrect. That is the message for a truly happy Easter, through forgiveness to rise above and to resurrect around our grievances, the ones that were holding against ourselves or the ones that were projecting out into the world. We’re not here to judge crucifixion. We’re not here to judge healing. We’re not here to judge are brothers and sisters. We’re not here to judge A Course On Miracles. One place in the Course it actually says forget the Course. We have this ACIM. We study it. We can’t hold on to it too tightly because it will trap us as well. We have to let go of it if we are really going to enter into the divine. I think that’s what will give us the resurrections that we all truly need around what ever crucifixions that we have in our lives. That’s what will give us a happy Easter that I hope I am sharing with you today. This article appeared in the May 2010 (Vol. 24 No. 3) issue of Miracles Monthly. Miracles Monthly is published by Community Miracles Center in San Francisco, CA. CMC is supported solely by people just like you who: become CMC Supporting Members, Give Donations and Purchase Books and Products through us.